The S.S. William Clay Ford, a Great Lakes freighter, was scrapped in 1987 and its pilot house was brought to the Dossin Great Lakes Museum. The S.S. William Clay Ford provided years of reliable service transporting iron ore and coal from the upper Great Lakes to the River Rouge Steel Plant, a subsidiary of Ford Motor Company. Built in 1953 at the Great Lakes Engineering Works in River Rouge, Michigan, as a 647-foot straight-decked vessel, the S.S. William Clay Ford was lengthened to 767 feet in 1979. Despite this change, the vessel still could not compete in the transportation industry because freighter size and technology kept advancing. Rouge Steel replaced it with two self-unloading vessels that had the capacity to unload their cargo through a series of shipboard belts and booms at any lake port. Shipping on the Great Lakes became increasingly important to the port of Detroit as the city grew. Because of the poor quality of early roads and US highways in Michigan, water travel represented the most practical and economic mode of travel. Sailing ships built to maximum size for travel through a canal, lock or specific water depth traveled through the Great Lakes. Their schedules were unpredictable because they were depended on wind for propulsion. Freighter design changed for economic reasons. New innovations produced vessels that could keep up with the demand for commerce. In the 1830s, steam powered ships made lake travel more flexible and reliable. The introduction of iron allowed shipbuilders to design and build larger, more durable hulls. When the S.S. William Clay Ford docked at a port, it needed the help of the crew on the dock to unload its cargo. New technology allowed owners to eliminate this expense and increase profits. Over time, ships got bigger and faster. As design of self-unloading technology was developed, the S.S. William Clay Ford became obsolete. It was taken apart, its metal recycled, and a portion – the pilot house – donated to the museum. under the command of Captain Donald Erickson in search of survivors from the doomed S.S. Edmund Fitzgerald. All hands aboard the S.S. Edmund Fitzgerald were lost that day, but the S.S. William Clay Ford’s crews' bravery received much recognition. The lower level of the pilot house shares the S.S. Edmund Fitzgerald story, and the role that the S.S. William Clay Ford played in its rescue attempt. The lower level also provides visitors with information on the design and purpose of freighters. Visitors can try to dock the S.S. William Clay Ford in a port with a video simulator. 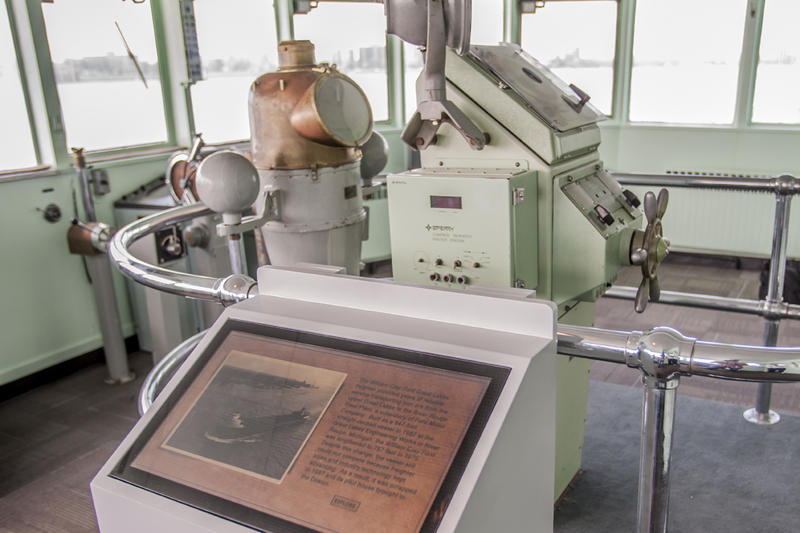 At the exit of the pilot house, a periscope that came from the submarine, the U.S.S. Tambor, allows visitors to see the Detroit River and current passing vessels. The U.S.S. Tambor proved instrumental in the U.S. Navy’s success at the Battle of Midway. This battle represented an important victory because it changed the tide of the war against Japan during World War II, giving the US control over a series of islands that allowed it to bomb the main islands of Japan. The bombing included the two atomic bombs which led to Japan’s surrender. The U.S.S. Tambor sunk many ships on its tour of duty during World War II.